When travelling in Mongolia, every top of the hill or mountains you would encounter group of piled ricks. Those piled rocks are called Ovoo in Mongolian and it is one of the worshiped and respected places in Shamanistic belief. When passing by Ovoo travelers are required to walk around it three times and place rocks on it. In doing this not only is a person showing respect for the spirits, which would be the least required of him or her, but adding to the spirits power symbolically by adding the rocks he or she is receiving wind horse and good luck for his or her journey.
" 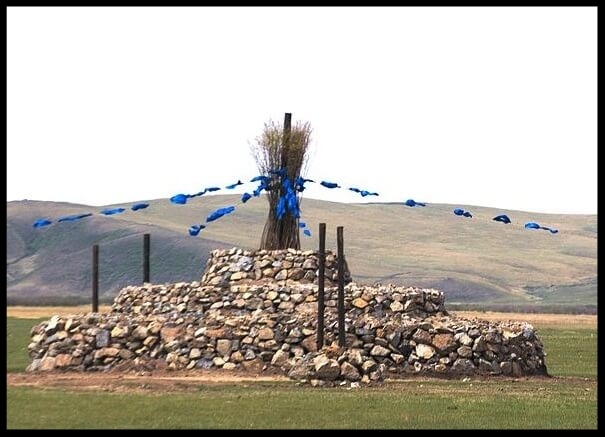 More profit is mine, big Ovoo is yours"
Ovoos are also sites of several ceremonies during the year, which nearby families or clans would celebrate in honor of the local spirit as well as Father Heaven and Mother Earth and other Shamanist spirits. Ovoo is not only represent mountain, but by their upward pointing nature they also represent a point of closer contact between Heaven and Eath, just as a mountain top is considered to be closer to Tenger (Sky) and therefore spiritually powerful. Remaining rituals directly address Tenger (Sky), and are held at Ovoo shines dedicated to Tenger and Mountain spirits. In most rural areas women should not climb sacred mountains but must pray at the foot of the mountain. In Tengerism, the meaning of life is seen as living harmony with the surrounding world. Tengerist believes view their existence as sustained by the eternal blue sky, Tengri, the fertile Mother Earth, spirit Eje.